We recently had the pleasure of traveling to Charlottesville, VA. We met up with fellow bloggers, wine tourists, and oenophiles, Brian and Dax Yost. Brian and Dax are known for Wine Tourist Magazine. Brian also writes The Virginia Grape wine blog. Both are big advocates for East Coast wines. Brian was able to arrange some tours for us. We started with a visit to Blenheim Vineyards. We had the pleasure of meeting Blenheim’s winemaker and General Operations Manager, Kirsty Harmon. Kirsty is a respected Virginia winemaker. She describes her wine style as fruit forward and approachable. Blenheim does have a famous owner. Singer Dave Matthews who has ties the Charlottesville area owns Blenheim. Dave and Kirsty have an agreement. She sticks to the wine and he sticks to the music. Dave does provide artwork for some of Blenheim’s wine labels. Otherwise, Kirsty has pretty much free reign to create the wine she wants. Blenheim is unique in that all of its wines come in bottles with screw caps rather than the traditional corks. Some folks turn their noses up to screw cap wine, but it has a much lower failure rate than traditional corks. Blenheim is a 30 acre estate with 17.5 acres under vine. They produce around 8,000 cases of wine a year. Kirsty picks her grapes for acidity rather than sugar. This is typically between 21 and 22 Brix. She also makes picking decisions by tasting the grapes. No wine is overly oaked. Ten months or so is about all a particular wine might spend in oak. Kirsty uses a combination of French, American, and Hungarian barrels. Grapes are harvested by hand. They’re also sorted by hand. A sorting table is used to find the best berries for wine making. The 3 ton bladder press is used to press the juice from the grapes. Kirsty using punch downs during fermentation. The winery sits just below the tasting room. Glass enclosures allow for a bird’s eye view of the activity of the winery. Kirsty let us taste a number of wines from the 2016 and 2017 harvests. Stand outs were the 2017 Albariño and 2016 Painted White. The Albariño was whole cluster pressed, fermented and then filtered. It had notes of peach and pear. The nose was soft and floral. The Painted White whose label features a painting by Dave Matthews is a blend of 59% Sauvignon Blanc, 31% Viognier, and 10% Chardonnay. It spent 10 months in predominately French oak. It had notes of peach and honey with just a touch of oak. The finish was crisp and clean. 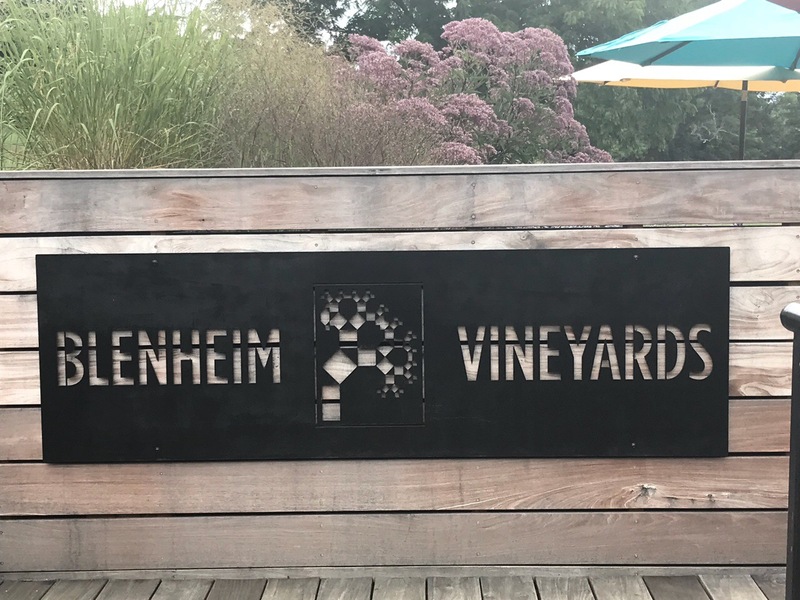 We highly recommend a trip to Blenheim anytime you’re in the Charlottesville area. They’re always one our of favorite stops. Thanks to Kirsty for taking the time to show us around and taste some great wines! We look forward to visiting again soon! It’s that time of year again where we take a few days off and enjoy a wine adventure. This year, we’ll be attending the American Wine Society annual conference in Tysons Corner Virginia. 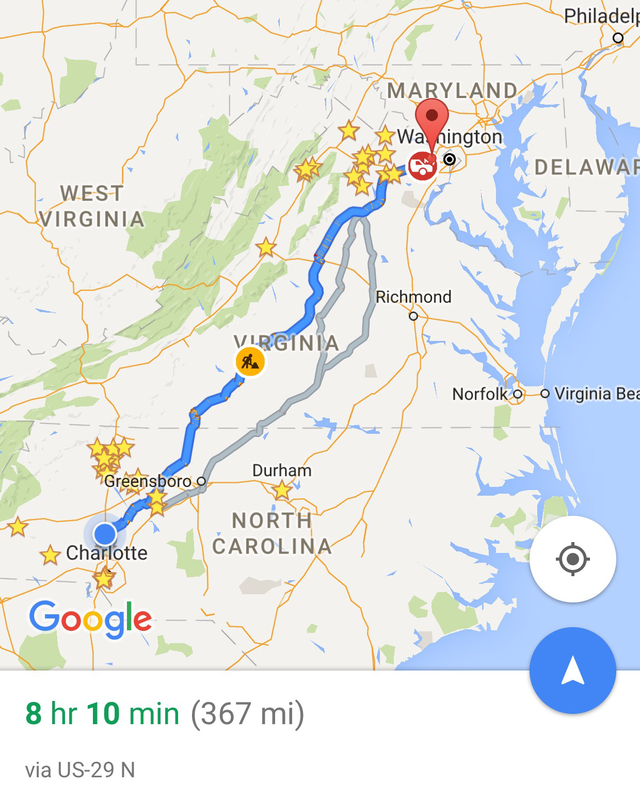 While we’re headed north, we’ll be stopping at several Virginia wineries, breweries, and ciderworks along the way. With a stop in Charlottesville early in the week, we’ll be in a great spot that has a variety of options. Keep checking back here for more updates. You can also follow our trip on Twitter, Facebook, and Instagram.